With its origins in America, street food is now taking hold in Europe, and in extremely creative fashion. The reason for its success is its ability to satisfy an ever-increasing demand for convenience, whilst at the same time following new consumer behaviour. One original example of this trend is Gin Truck, the business with which the entrepreneurial Spanish barman, Albert Goldentaer has made his cocktails mobile, moving away from the standard concept of a bar. Running touchpoints at events, fairs, concerts and sporting fixtures is the new business model on which street food projects like Gin Truck are based. Despite not being an expert in either visual marketing or printing, Albert understood the importance of making Gin Truck appealing by using a personalised and individual image. For this he turned to a marketing agency to create a visual identity, and then chose Pixartprinting as his supplier of high quality printed products. He lists the many advantages of using Pixartprinting as being its service and varied catalogue, as well as the opportunity to use a single online shop to order the right mix of printed items to he required. He added that one of the services he most appreciated was receiving email updates on the progress of the order and added: “In addition, Pixartprinting’s reliability and just-in-time service will enable me to change the look of the truck whenever I want, so that I can adapt the designs to suit the requirements of specific events, promotions and seasonal trends”. 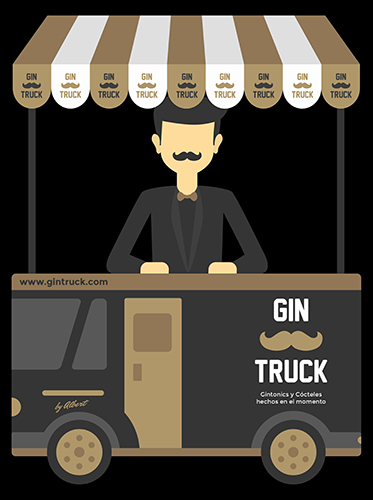 Gin Truck is not so much a business as an ongoing experiment, a workshop and a lifestyle and for Albert finding a supplier capable of following the evolution of his project provides the further stimulus he needs to make his marketing even more effective and welcoming.